Relocation is a tricky and tough job that spurs both excitement and anxiety. While new people, changed place and bright prospects and opportunities add to the excitement levels, the job of packing and moving drains you physically and financially, making it strenuous and stressful. But hiring professional movers for your local or interstate move can prove to be a prudent decision. 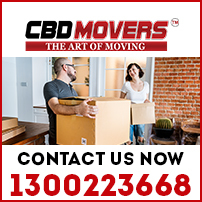 At CBD Movers™, we are the best removalists in Melbourne. Well-known and reputed for our removal services and qualified support staff, we offer the finest solutions for an easy and effective move. From careful planning to meticulous packing and moving, we offer full- service deals for a positive and pleasant relocation. At CBD Movers, we take pride in our superior moving services. We offer to outclass removal services and possess the latest supportive gear. Our skilled personnel strives to make each move a successful one. We understand the distinct needs of the clients. Our customized services cater to requirements and budget in full. Our ‘Movers & Packers’ deal is ideal for comprehensive shifting of office and home set-ups. We also undertake ‘Two Men & Truck’ services for the quick moving of one-off items like pool tables, pianos, and heavy furniture. We excel in packing and use quality packing material for a safe and secure move. We hold all the necessary licenses and authorizations required for moving local, interstate or international. We own a huge fleet of trucks. Our vehicles are fully equipped with the latest systems and ensure a safe move through varied terrains. At CBD Movers, we are well-known for our fine removal services and affordable rates. Our policy to beat every written quote by 10% makes us the cheapest removalist in Melbourne. Our comprehensive goods-in-transit-policy provides complete protection in all situations. Our operations are transparent with no hidden extras and clauses. St. Albans, a suburb of Melbourne, Victoria, Australia is 15 kilometers north-west of the Melbourne Central Business District. Spread over an area of 13 square kilometers, it is home to nearly 35,000 people. 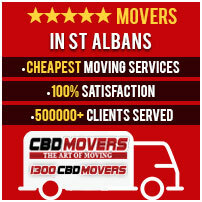 At CBD Movers, we offer unmatched removal services to the people of St. Albans. Our services help people move in and from St. Albans in an easy and hassle-free manner. Our services are safe, time-bound and reliable. Call us at 1300 223 668, to learn more about our relocation services and customized deals.